Treyarch talked about the past and future of Zombies to mark the tenth anniversary of the mode at the Black Ops 4 Panel at San Diego Comic-Con 2018. Treyarch hosted a panel at San Diego Comic-Con this year, and in honor of the tenth anniversary of the Zombies franchise the focus of the panel was the Zombies mode in the upcoming Black Ops 4. If you've watched a Call of Duty reveal event before, you know that they are slick, well-orchestrated productions, which is about the complete opposite of a Call of Duty Comic-Con panel, casual, low-key, and barely scripted. It's fun to see the team behind the game have a good time talking about the game that they love. This year's panel featured Zombies Director Jason Blundel and Lead Writer Craig Houston, with Treyarch's Director of Communications John Rafacz moderating the event. They began the panel with some reminiscing about the genesis of Zombies as a hidden bonus mode in Call of Duty: World at War back in 2008. They knew they had something good in Zombies, but would have never guessed that it would grow into the full-fledged phenomenon that it has become ten years later. 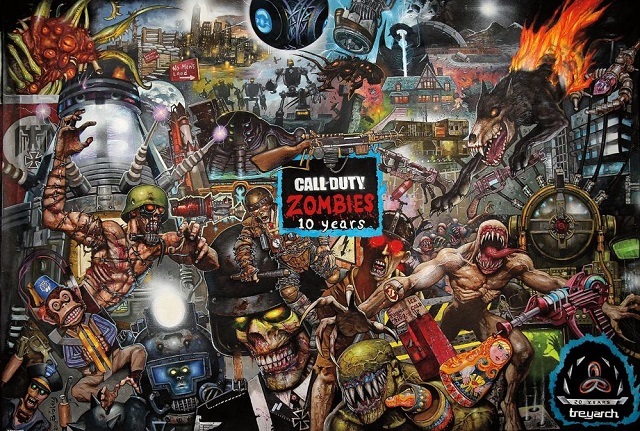 To commemorate that ten-year journey from a secret side project to a major game mode, the team at Treyarch commissioned artist Simon Bisley to create a painting capturing some of the iconic moments, heroes, and zombies from the entire franchise. The painting was then unveiled for the first time to the public, after which the panel announced that everyone in attendance would get a poster of the painting. Later in the panel it was revealed that you can also get a copy of it in the form of a 1,000-piece puzzle if you order the Mystery Box Edition of Black Ops 4. 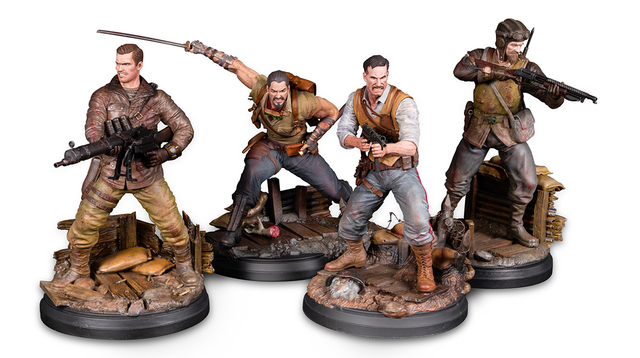 After the video debut, they walked over to a crate sitting on the other end of the table and lifted it, revealing a new line of collectible statues featuring the four members of the Primis squad. They will be released one at a time, with Richtofen being first and made available for pre-order immediately after its unveiling. The panel then moved on to the other main storyline in Black Ops 4 Zombies, Chaos, and the two settings within it revealed so far, IX and Voyage of Despair. After replaying the previously released Chaos intro trailer, they revealed a few new nuggets of information on it. They mentioned that the most common question that they've been asked since the video was released is, 'will you fight the zombie tiger?' Well, the answer is yes, but they also noted that the tiger is not a level boss, hinting that something even bigger and more terrifying is waiting for you later in the game. They also mentioned that Black Ops 4 will debut factions within the Zombie mode - Bloodfaith, Tempus Novi, Dustborn, and The First Legion - but they didn't reveal anything beyond that your choice of faction would affect your progress along the story path. The panel also revealed that they want the Zombies mode in Black Ops 4 to be more accessible to new players than in previous Call of Duty games. When you first begin playing the game it will ask you a series of questions to determine which tutorials you should play before jumping into the full mode. There will also be a new UI that will act as a player guide and provide recommendations as to what you should do next. The Chaos storyline will introduce a new set of heroes, and Treyarch has teamed with Dark Horse Comics to tell their background stories. These comics won't spoil anything you'll discover through playing the game, but will help expand the narrative by showing how the heroes got to where they are when the game's story begins. The panel concluded with one final unveiling ' the Mystery Box Edition of Black Ops 4. 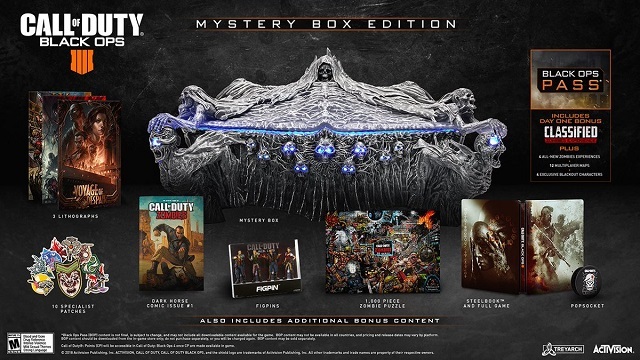 The centerpiece of this edition is the Mystery Box itself, a replica of the one you'll find in the game's Zombie mode. Open the lid and the interior of the box lights up as it emits ghostly screams.